We all take a defeat every once in a while. We need them or we don’t learn a damn thing. Its not the defeat itself that matters its our response that matters. Notice I said response instead of reaction. Reactions are based on what emotion rises to the surface in the moment of defeat. None of that last sentence is good. In fact, its toxic. Powerful men respond in a pre-planned and deliberate manner. Their response is cool and calculated and built entirely on the facts of the circumstances and not on the emotions. This is first because it is by far the most important of the three. When powerful men fail they do not react in any way. In fact they react as if they fully expected the outcome. They reserve judgment until they have moved past whatever emotional response bubbles to the surface upon realizing the failure. No labels, no judgement, no response in any way shape or form is allowed in the moment. They set it aside until they can regroup and respond with precision. They can’t stop the very human emotional response completely but that’s not the objective. The objective is to not give in to their emotions by reacting without a plan. Once the wave of emotions have passed they asses the damage and take appropriate action quickly. They forget about how the failure made them feel and focus 100% on how the failure needs to be repaired. They strip any and all emotions out of the damage control process. They respond with a sober mind that is void of any feelings whatsoever. Feelings can be important if the failure is around a relationship but the solution should not include feelings even if it is about something as emotional as a personal relationship. Powerful men make sharp and crisp decisions that are weighed and tested even when they involve affairs of the heart. Repairing a stupid move that upset a loved one can be heartfelt and meaningful but it better be smart and precise otherwise it can make things worse. 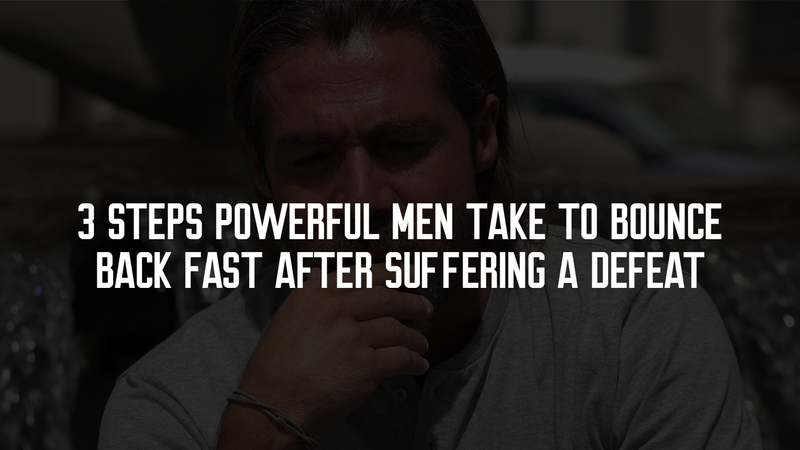 Lastly, powerful men do not, under any circumstances, carry the burden of any defeat beyond the time it takes to address it. They coldly extract the lesson and erase it from their memory. Holding on to anything beyond the lesson is an utter waste of their resources. They will not have any part of a lingering effect of any failure. The baggage of defeat will not help them but the lesson will so they keep the lesson and toss the baggage out the window. To wrap things up I will leave you with this quote from the highly relevant words by the great Winston Churchill…. “Success is stumbling from failure to failure with no loss of enthusiasm”.